At $99 per year for a single user, mobileme is fairly expensive, especially for iPod Touch users who can’t even take advantage of the entire feature set, so we wanted to find a cheaper alternative. We know that our solution may not be ideal for everyone, but perhaps it could be used as a jumping off point for your own solution. We want Over The Air syncing and not be tethered to a PC for iTunes syncing of Calendar Events and Contacts. All personal contacts are stored in Google Contacts, Work Contacts are stored in Outlook. Access to online storage for documents, pictures etc. The main issue really stems from the iPod’s lack of support for multiple Microsoft Exchange accounts on the same device. So you either have to choose to sync your Google contacts/calendar evvents, or your Outlook account (which in our case is our work email and calendar events). So we needed an easy way to access both of these accounts on the cheap. That’s where Google, Dropbox and Sync In A Blink come to the rescue. 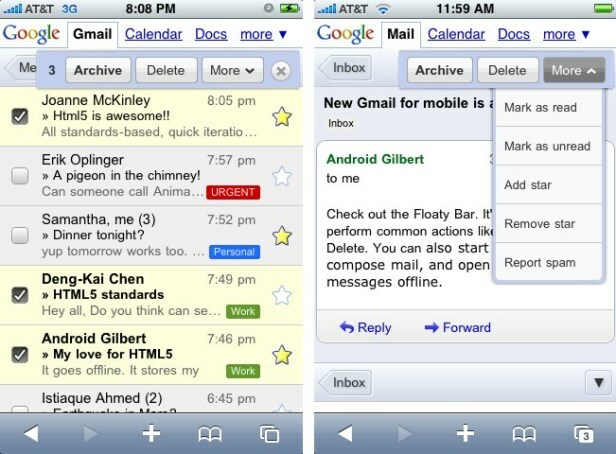 For a universal email address (like MobileMe’s ‘.me’ address) you need to look no further than Google Mail. All you have to do is just sign up for a free Google Mail address with 5+ GB of storage and either forward all of your other email addresses there, or setup Gmail to check these accounts as well. Then you can just use label filters to keep the mail from individual accounts organized. The Gmail SPAM filter is great and catches 99.9% of all our spam mail. Now you’ll be able to access your email directly through the mail app, or through Google’s web 2.0 interface through the mobile Safari Browser. Setup your work’s Outlook account info as your one (and only) Microsoft Exchange account on the iPod, it’ll be good to go. 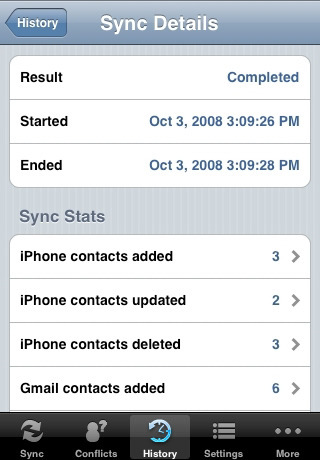 Sync In A Blink is a fantastic, simple and easy to use iPod/iPhone App which allows you to quickly synchronize your Google Gmail Contacts with the contacts on your iPhone and vice-versa (all over the air). It actually offers a boatload of additional advantages over even using Microsoft Exchange to perform this function. So even if you are not using your one Microsoft Exchange account for your business Outlook account, Sink in A Blink may be something that you want to consider for contact syncing w/ Google Contacts. 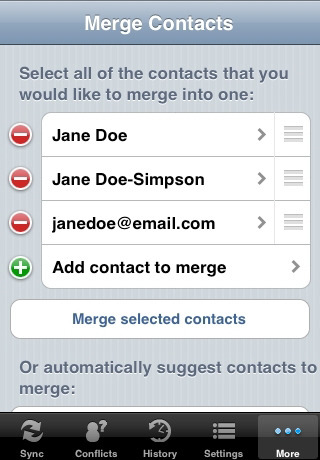 The biggest single such advantage that we have found with Sync In A Blink is its ability to keep all of your contact groups (with Microsoft Exchange, all contacts appear in a single group) allowing for sorting by Family, Friends, etc.. The only real downside with Sync In A Blink is that updates are not automatic. Meaning that you must run it manually whenever you want to do the syncing, but that’s due to Apple’s disallowing of background run applications. In the grand scheme of things, its a minor inconvenience for all the it enables. We’ve been using it for several moths now and we highly recommend it. It has several built-in safeguards to help avoid data corruption to either you Google Contacts or the ones on your iPhone. The App is well documented and supported by the developer and has its own users forum. For more detailed info, we recommend visiting http://www.syncinablink.com. Our business Contacts are covered by Microsoft Exchange with Outlook, so nothing else needs to be installed here. At this point, all of our personal appointments are still stored in Google Calendar, which is accessible via the web, but we wanted to get these into the iPod’s native Calendar App, so we had to find an alternative solution since (again) we are using our one Microsoft Exchange account for our work Outlook Calendar. Sure, we could use iTunes (requiring a cabled sync for updates) or some external Calendar app to do this but instead we opted to use Google’s free Google Calendar Sync PC application which syncs our Google Calendar with our Outlook Calendar automatically. Google Calendar Sync gives you the option of syncing just your Google Calendar info into Outlook or also having all Outlook Calendar info synced into your Google Calendar. Either way, when Microsoft Exchange pulls in all your calendar events, both personal and business related events will get pulled into the iPod’s Calendar app. Note that unless you enable bi-directional syncing between Outlook and Google Calendar (within Google Calendar Sync), new events created directly on the iPod will only sync to Outlook, not Google Calendar. For online storage of photos or other data, we decided on Dropbox. Dropbox consists of both an app for the iPod and an app for your PC. It basically creates a folder on your PC where you can drag items which are uploaded to your online store space (up to 3GB Free) which are then immediately accessible from your iPhone App. 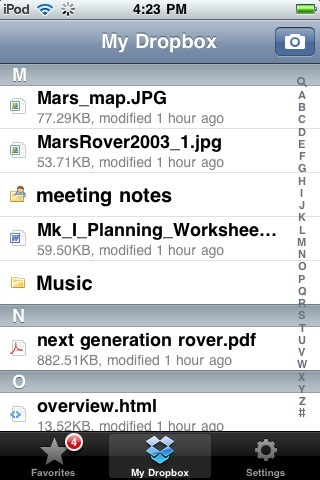 You can use this space to store photos or whatever other documents you may want to access from your iPod. Additionally, you can access any files in your share from the web and you can password share individual items with anyone you want. More storage space is available for a fee, but you can get up to 3 GB free by referring a few friends. So that’s our $4.99 solution which works quite well for us. We hope that it inspires you to come up with your own solutions. If you have any alternative suggestions please feel free to put them in the comments section of this post.